Learning how to cook some of the delicious South Indian food that I have encountered here was high on my wish-list for this trip, so I jumped at the chance to attend a cooking class in Periyar. In the end only four of us opted to take the class, which turns out to be just as well, as our host has sneakily added an additional four people, who are waiting for us when we arrive at the top of the steep, narrow path to a small outdoor cafe, in the front yard of our host’s family home. Our host can only be described as the Indian, teetotal version of Keith Floyd. He certainly has the larger-than-life demeanour required of a TV chef, utterly wasted in his day-job as a rickshaw driver. The living room of the family home has been cleared to make way for a large table, on which gas burners sit ready for use. But as any cook knows, the first item on the agenda is always prep. Outside we take over the cafe tables and are set to work chopping, peeling and slicing red onions, garlic, beans and potatoes. The fundamental ingredient in South Indian cooking is the coconut. If there isn’t coconut milk or chopped coconut, then there’s a high chance your meal will have been cooked in coconut oil. 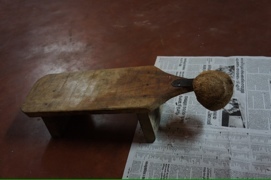 The chef’s mother is on hand to show us how to grate a coconut the old fashioned way, sitting on a wooden stool to which a lethal-looking star of metal has been bolted at one end, and running the halved coconut over the blade to produce the familiar stringy white pulp. To make coconut milk, this pulp is wrung out by hand into water until the water thickens and turns white. 1. Make sure all of the ingredients are sitting in front of you, measured and prepped, ready to throw into the pan. 2. Heat 1-2 T coconut oil. 3. Add black mustard seeds, cook for a few seconds until they start to pop. 4. Throw in a handful of curry leaves (they must be fresh, god only knows where I’m going to find them in London, anybody know?). The oil will fizz and bubble. 5. Add the main ingredients, meat/fish if applicable, cook through for a few minutes. 6. Throw in your spices or spice paste, and coconut milk if required, for a few more minutes then serve. 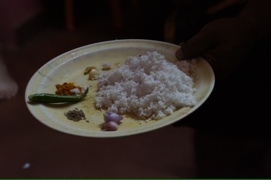 A standard mortar and pestle would do to make the spice paste, but our host (or, to be fair, his mother) relies on even more traditional methods. Outside the house sits a huge heavy stone which is grooved in the centre from decades of use. In the groove rests a stone rolling pin of sorts. 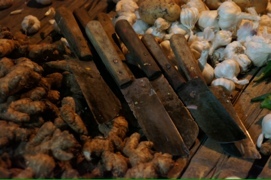 The necessary spices are placed in the centre with freshly grated coconut, and ground together with the rolling pin to make the paste. 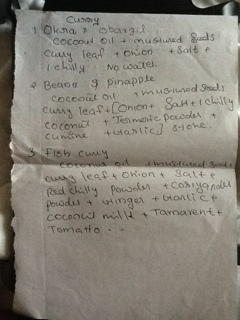 For pineapple curry, we combined freshly grated coconut with garlic, a red chilli, onion, salt, turmeric and cumin. It’s slow and laborious when I try, but his mother makes quick work of it. A blender would be faster still, but where’s the romance in that? Besides, like a seasoned wok, I’d like to think the stone somehow added to the flavour. 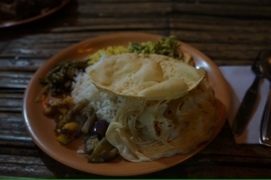 To accompany our various curry dishes, there is fresh basmati rice (bigger and longer than the exported varieties), and we have a chance to make our own roti to accompany the dish. First the dough – a well is made in the flour and the wet ingredients mixed directly on the marble bench top. 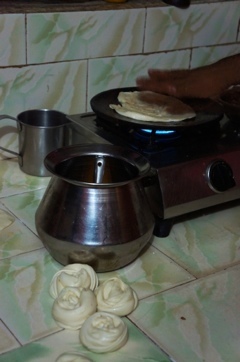 The dough rests for a while, then we each practice breaking off small pieces to knead, roll, stretch and shape into the flat round pancake shape which is fried on a flat griddle, then (while still hot) clapped between your hands to create the distinctive layered effect (and brushed with ghee if desired). At last it is time to sit down and try our creations (and those created for us), at the long table in the yard of the cafe. The vegetarian dishes are delicious (though sadly, a little cold by the time we eat – perhaps time was spent on one dish too many? ), but the chicken drumsticks which look deliciously charred, and which have been slowly roasting over coals in a sunken pit since our arrival, prove to be red raw in the centre and are hastily spat out. It would have been nice to stay and chat with the other attendees, who are in the midst of their own journeys and have been to some interesting places (one girl has been to the ashram of the Hugging Mother, where devotees queue for hours for a hug from their guru), but there is another early start tomorrow – in any case it’s after ten by the time we find our way back down the path to the waiting rickshaws. 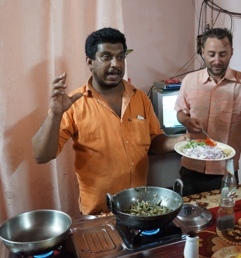 It has been a fascinating experience, and with a few tweaks (reheating the veg food for the meal, a smaller class, either cooking the chicken or leaving it out), it could be a truly excellent cooking class – our hosts have given us a great introduction to South Indian food, leaving me keen to learn more. 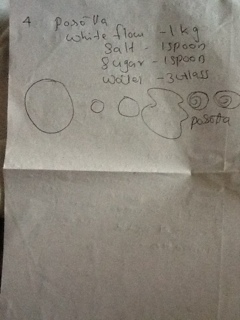 When we are leaving the next day, we stop briefly at the bottom of the path to the cafe again, and someone comes down with a sheet where they have written some of the recipes for us – I don’t think I am giving away any trade secrets by sharing this one…. ….or the paratha recipe. I shall leave the interpretation of the diagrams to your imagination. wow. not at all envious. no.